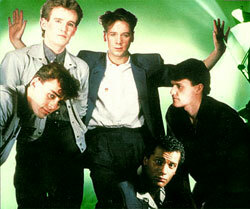 Simple Minds Biography, Discography, Music News on 100 XR - The Net's #1 Rock Station!!! Simple Minds were at the forefront of the New Wave movement that followed Punk before evolving into one of the most internationally successful stadium-Rock bands of the '80s. 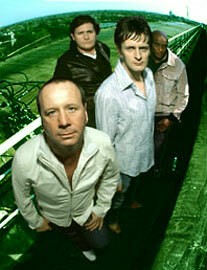 The group was founded in Glasgow, SCOTLAND, in early 1978 by lead singer Jim Kerr and guitarist Charlie Burchill; with Duncan Barnwell on second guitar, keyboardist Mick McNeil, Tony Donald on bass and Brian McGee on drums, the band started gigging around their hometown and eventually cut a demo tape; sent out to the music press and record companies, it was described by the NME as “the best demo tape they'd ever heard”. Around this time Donald left the group and was replaced by Derek Forbes, Duncan Barnwell also left after it became apparent that two lead guitars were not required, thus leaving the band as a quintet. Simple Minds were subsequently signed to Zoom Records, an independent label marketed by Arista Records, who released their debut album, "Life In A Day", in April 1979, it reached the #30 on the National LPs Sales chart with some mixed critical reviews. That same year, the band signed directly to Arista, then recorded and released its second album, "Reel To Real Cacophony", in November, but the record failed to crack the charts. The band took "Real To Real Cacophony" on the road, they made their first trip to the United States with one night in New York. Time was also spent touring extensively across the U.K. and Europe; when they returned to the studio to record their next album, shifted gears once again and September 1980 saw the release of the synth-based LP, "Empires And Dance"; it reached the #41 on the Official British Pop Albums chart and generated the single "I Travel", the track scored notable club success on both sides of the Atlantic. Following a successful European tour which included dates with Peter Gabriel, Simple Minds delivered their follow-up album that marked the band's departure from Arista and the inking of a new partnership with Virgin Records; "Sons And Fascination" and "Sister Feelings Call" were released together in August 1981 and subsequently were sold separately; the special double-LP package reached the #11 on the British Albums chart while the single "Love Song" cracked the U.K. top 50; Brian McGee left the group after suffering a breakdown, the band then embarked on a tour with new drummer, Kenny Hyslop; after completing the tour with stops in Canada and Australia, a couple of singles, "The American" and "Love Song", cracked the top 10 in both countries. Preceded by the U.K. top 20 single, "Promised You A Miracle", Simple Minds' sixth album, "New Gold Dream (81-82-83-84)" soared to the top 3 of the British chart and became their first album to break into American Top 200 LPs & Tapes chart, peaking at #69; this album was completed using three drummers Hyslop, Mike Ogletree and Mel Gaynor, the latter was eventually recruited as permanent member. "Glittering Prize", the second single, also reached the U.K. top 20 and its follow-up, "Someone Somewhere (In Summertime)" reached the #36 spot. In February 1984 the group issued "Sparkle In The Rain", the U.K. top 20 hit singles "Waterfront", a brash, pulsating grandiose performance and "Speed Your Love To Me" prefaced its release and the album went straight into the British Pop Sales chart at #1 that same month; it also featured "Up On The Catwalk", a further top 30 entrant. In the U.S. "Sparkle In The Rain" hit the #64 on The Billboard 200 Albums list while the band supported The Pretenders. Then a surprise announcement was made that Kerr and Chrissie Hynde had been married in New York City. The following year Simple Minds scored an unexpected smash hit with "Don't You (Forget About Me)", the song which was used on the soundtrack of the film "The Breakfast Club" peaked at #1 on both the Billboard's Hot 100 Sales and Mainstream Rock Tracks charts; by the time the single reached the #7 in Britain and became a worldwide radio staple. However, the song did not appear on the following "Once Upon A Time" that the band began recording without Derek Forbes. Simple Minds played at the Live Aid concert in summer 1985 with the new bass player, John Giblin and the new line-up delivered their eighth album at the beginning of autumn; "Once Upon A Time" debuted at #1 on the U.K. Pop chart and climbed into the top 10 of the American Billboard 200 Albums list, the set spawned no less than five smash singles, "Alive And Kicking" hit #3 on The Billboard Hot 100 and #2 on The Mainstream Rock chart, "Sanctify Yourself" peaked at #3 and #14 respectively on Billboard's Active Rock and Hot 100 Sales charts, "All The Things She Said" became the album's third American Top 40 hit and also cracked the top 10 of The Mainstream Rock chart; in addition the band made U.K. top 10 with all of their first three singles off the album and scored one more top 20 hit with "Ghostdancing". In May 1987, Simple Minds released the stopgap "Live In The City Of Light", a double-disc set recorded in Paris on the last date of "Once Upon A Time" world tour, in August 1986; the record reached the #96 slot on The Billboard Top 200 chart and went straight to #1 in Britain becoming the fastest selling double live album of all time while the extracted single "Promised You A Miracle" reached the U.K. top 20. On June 11, 1988 the group performed at Wembley Stadium in London for Nelson Mandela's 70th birthday, but although a new composition, "Mandela Day", was written for the event, Simple Minds refused to release it as a single, fearful of seeming opportunistic. In February 1989 the group scored their first #1 single in the British chart with "Belfast Child", a lengthy, haunting lament for Northern Ireland based on a traditional folk song called "She Moved Through The Fair"; the B-side of this single was "Mandela Day". Three months later the band released the moody and atmospheric album, "Street Fighting Years", it shot to #1 in the U.K. and yielded two further top 20 hits in the shape of "This Is Your Land" and "Kick It In"; in the United States the record didn't make much of an impression on The Billboard 200 chart reaching a modest #70, although three singles cracked the top 10 of The Modern Rock chart: "Mandela Day", "This Is Your Land" and "Take A Step Back". Giblin left the band before Simple Minds headed out on the road to support "Street Fighting Years", his replacement was The Pretenders bassist Malcolm Foster; at that time it was also revealed that Kerr's marriage with Chrissie Hynde was all but finished, this turbolent period closed with the departure of core member Mick MacNeil and the ending of the group's ten-year association with manager Bruce Findlay. Simple Minds remained as a three-piece band, with Kerr, Burchill and Foster and in April 1991 they released "Real Life", the set debuted at #2 in U.K. and reached the #74 on the U.S. Top 200 Albums chart; the first single off the CD, "Let There Be Love" shot to #6 on the U.K. Pop chart while in America "See The Lights" smashed at #1 on Modern Rock Tracks chart and also cracked the top 40 of The Billboard Hot 100; when it was subsequently released in the U.K. reached the #20 on the National Pop Singles list; one more single, "Stand By Love", appeared in the top 20 of the British chart and hit #4 on Billboard's Modern Rock Tracks list. In October 1992 the band issued the best-of compilation entitled "Glittering Prize 81/92", the set surprised everyone when it shot to #1 in Britain and also revived "Love Song" which rose to #6 on the U.K. Pop Singles chart. After nearly four years, at the beggining of 1995 the band was ready to release their eleventh album of new material, "Good News From The Next World", which made a mid-chart appearance on the American Billboard's Top 200 chart and peaked at #2 on the U.K. Pop Albums chart; perhaps the lead single, "She's a River" climbed into the top 10 on both Mainstream and Modern Rock charts and hit #5 on the U.K. Pop Sales list; a second single, "Hypnotised", also entered the U.K. top 20. Kerr and Burchill along with keyboardist Mark Taylor and session drummer Mark Schulman set out on the road in North America and Europe in support of the release. After another lengthy hiatus, during which time original bass player Derek Forbes rejoined his old chums, Simple Minds left Virgin Records, joined Chrysalis Records and delivered their next album, "Néapolis", in March 1998; the record barely sneaked into the U.K. top 20 and featured only one minor hit single, "Glitterball"; consequently the new label felt there was not enough of a following outside of Europe to justify the worldwide release of the album. In the fall of 2001 was released "Neon Lights", Simple Minds' debut for Eagle Records and their first covers album, which was followed by the band's fourteenth studio record "Cry", in April 2002. In September 2005 the group's founding members Jim Kerr and Charlie Burchill are back once more, they issued their new album, "Black & White 050505" on Sanctuary Recors, it includes the single track "Home".